HomeJab works with thousands of agents and the feedback we received was that most people were not happy with 3D tours. They thought the tech was cool, but preferred to watch video. 360 video is the best of both worlds. Buyers can sit back and watch with the freedom to explore further if they choose. HomeJab, a tech company specializing in media production for the real estate industry, has created and released new 360 interactive video. The 360 video can be played as a standard video, but offers the viewer the ability to interact by clicking and moving around to view the entire room. The 360 video was created as a cost efficient and more user friendly alternative to 3D scans. 360 video is slowly rolling out nationwide and will be available in all 50 states. 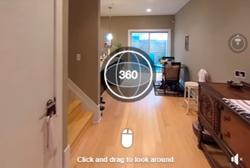 HomeJab is currently the only company offering a 360 interactive video option to real estate professionals. The necessity for 360 video grew out of concerns that 3D tours are too pricey and that potential homebuyers and clients are looking for a more versatile video. The 360 video gives the person watching multiple options for their viewing experience. The video can be played continuously without interruption and/or interaction, or the viewer can click on the screen to look anywhere in the room. This allows the viewer to see more than typical listing photos and videos. To experience please click here. Please view in Chrome or Firefox.